CAMBRIDGE, Mass. (Reuters) - The Federal Reserve should raise interest rates "in the coming months" if the economy picks up as expected and jobs continue to be generated, U.S. central bank chief Janet Yellen said on Friday, bolstering the case for a rate increase in June or July. "It's appropriate ... for the Fed to gradually and cautiously increase our overnight interest rate over time, and probably in the coming months such a move would be appropriate," Yellen said during an appearance at Harvard University. Although Yellen expressed caution about too steep a rise in U.S. rates, she sounded more confident than she has in the past that the U.S. economy has rebounded from a weak winter and that inflation would edge higher toward the Fed's 2 percent target. "The economy is continuing to improve ... growth looks to be picking up," Yellen told a group of professors and alumni at the Ivy League college in Cambridge, Massachusetts. She expects the labor market to continue to improve despite much progress because "further gains are possible," she said under an open-air tent on campus. Prices for U.S. Treasuries fell after Yellen's remarks, while stocks rose. The U.S. dollar (.DXY) was trading higher against a basket of currencies. The probability of a rate hike at the Federal Open Market Committee's June 14-15 meeting rose to 34 percent from 30 percent before Yellen's remarks, according to CME Group, where the futures contracts are traded. Yellen's comment "reinforces the signals on early rate hikes communicated recently by her FOMC colleagues," Mohamed El-Erian, chief economic adviser at Allianz, said via Twitter of the policy-making Federal Open Market Committee. Weak oil prices and a strong dollar have been blamed for helping to keep U.S. inflation below the central bank's target. On Friday, Yellen said those factors "seem like they are roughly stabilizing at this point and my own expectation is that ... inflation will move back up over the next couple of years to our 2 percent objective." 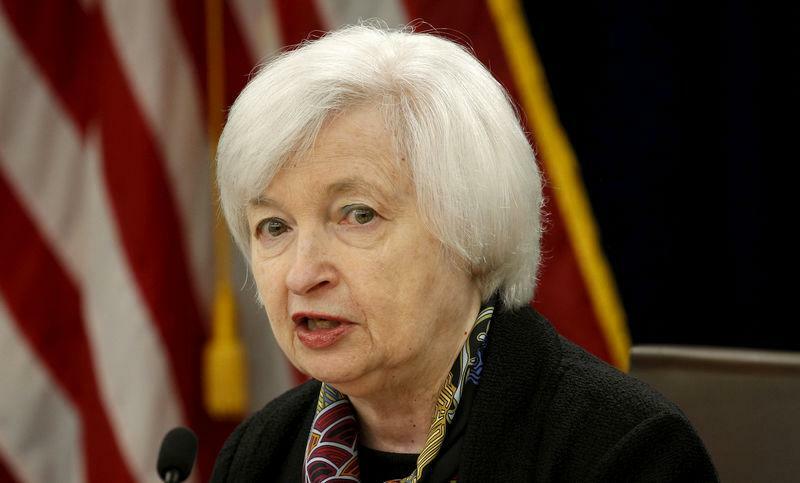 Still, she cautioned against hiking rates too quickly given the Fed's benchmark remains low at 0.25-0.5 percent currently. "It is important to be cautious ... because if we were to trigger a downturn or to contribute to a downturn, we would have limited scope for responding," Yellen said. The economy has not seen "much improvement in wage growth which is suggestive of some slack in the labor market," Yellen added just before receiving the Radcliffe Medal from Harvard's Radcliffe Institute for Advanced Study. Yellen was introduced by former Fed Chair Ben Bernanke, to whom she said Americans owe "an enormous debt of gratitude" for guiding the economy through the 2007-2009 financial crisis.